Nigeria: When Is the Right Time to Take Drugs - Before, After or With Meal? Does eating before taking our drugs or taking them after a meal affect the efficacy of the drugs? A number of us would have been told we should take our drugs after eating, on an empty stomach, or not to take certain drugs with certain foods. What are the factual bases of these instructions? The truth is that such instructions are relative and depend on the type of medication, the requirements accompanying a particular medication, as well as the type of food we are taking. It is first important to understand that food might trigger changes in our body. These changes include increasing the blood supply in the gut, increasing bile and also the level of acidity. These changes that are linked to our eating habits determine medication absorption. Hence the food we eat and the drinks we take affect medication and the response of a person's body to the medication. Taking medication after eating or with food usually means taking medication 30 minutes to one hour after a meal. For medication such as non-steroidal anti-inflammatory drugs (NSAIDs) (ibuprofen, aspirin), metformin for diabetes and steroid medication, these need to be taken after eating. With a few exceptions, and unless stated otherwise by a doctor, most anti-malaria medications are also taken with a meal. This is important because taking medicine after a meal not only ensures that medicine is absorbed into the bloodstream but also prevents side effects, stomach irritation and ulcers. Taking medication on an empty stomach (before food) means at least two hours after a meal and one hour before a meal. 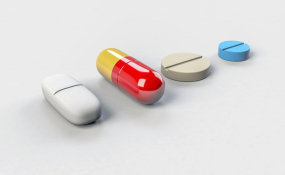 Some of the medications that are required to be taken on an empty stomach include Antihistamines, used to treat allergies, thyroid hormones and bisphosphonates, used for bone protection. They are taken on an empty stomach because taking them while eating prevents the stomach from absorbing the medication. Please note that in instances where you do not seek directions from the information provided on medication labels, always refer to a doctor or pharmacist for advice on taking medicine. The doctor's extensive knowledge of a patient's symptoms, their health history and specific health needs make them the first-line for advice. On the other hand, some medicines can work better or are affected not only by the presence or lack thereof of food in the stomach but also the type of food or drink. In 1989, a research group discovered that grapefruit and having grapefruit juice interacts and interferes with some types of medication. The medication that was found to be affected include statins that lower cholesterol, an anti-hypertensive medication, medication for heart arrhythmia, organ-transplant rejection medicines and anti-anxiety medicine. An enzyme found in grapefruits known as CYP3A4 is responsible for reducing the level of absorption of medicines. This is particularly important as CYP3A4 is involved in the bioactivation of almost 50 per cent of all drugs. Therefore, when grapefruit juice is consumed, the effectiveness of the drug is reduced and it also augments the side effects of the medication. Patients who take blood-thinning medication (anticoagulant) like warfarin, phenprocoumon and acenocoumarol were advised to avoid dietary vitamin K that can be found in leafy greens as it counteracts the effects of their medication. However, a recent systematic review later found that the effects of such foods were only detected for high vitamin K intake. The review suggests 118 grams per day of raw lettuce green leaf (equivalent to about one and a half cups of raw lettuce), 106 grams per day of cooked broccoli (equivalent to about one and a quarter cups of cooked broccoli), or 30 grams per day of cooked spinach (equivalent to about one-eighth of a quarter cup of cooked spinach) as a moderate amount in your diet. Hence to ensure the absorption of your medication, it is best to maintain a consistent diet that is not filled with an excessive amount of leafy greens. According to the U.S Food and Drug Administration (FDA), alcohol should be avoided if you are taking medication due to an increased risk of adverse effects. Consulting a doctor before you swallow your medicine with alcohol, drinking alcohol after taking medication and taking medication after having an alcoholic drink is important. The FDA warns that alcohol taken with antihistamines causes drowsiness. Pain relieving medication like paracetamol can cause severe liver damage when mixed with three or more alcoholic drinks, regularly. Also, NSAIDs, (drugs like diclofenac; a component of most body pain-relieving drugs sold by pharmacies and drug hawkers) can cause stomach bleeding when frequently mixed with three or more alcoholic drinks. In addition, do not take alcohol with a narcotic analgesic, asthma medication, statins, vasodilators-nitrates for treating angina, antibiotics, antidepressants, antipsychotics, sleeping medication (sedatives) and bipolar disorder medication. Dairy products like milk, yoghurt, cheese or calcium-fortified juices contain calcium which affects certain antibiotics such as tetracycline and ciprofloxacin. Calcium and antibiotic interaction occur when calcium binds to antibiotics and prevents their absorption to fight an infection, Neal Patel from the Royal Pharmaceutical Society said. He added, "Even if the milk affects just half of the drug, you're only getting half the dose, which could mean the infection isn't killed off by the end of the course." However, according to the FDA, it is safe to have a meal that contains the dairy products in them, especially in small quantities. In saying this, the aim is that we improve the effectiveness and safety of our medication by thinking carefully about when we take them. The various foods mentioned do not imply that we completely eliminate them from our diets as they include foods that form a holistic, nutritional and balanced diet. Rather, this offers a guide underpinned by experts advice that will help those taking the medications listed. Indeed, Dima Qato, a pharmacist and assistant professor at the University of Illinois, Chicago, who studied food and drug interaction, advised that "leaving at least two to four hours between the interacting food or juice and the medication is usually recommended." Tavershima Adongo, a medical consultant with the Premium Times Centre for Investigative Journalism, said: "When we take medicines, they act on our bodies and our bodies act on them. These actions are determined by different factors within our bodies, among which is the type of food (by which we mean both solid food items and drinks) we eat around taking our medications." He said this is because food in the body is broken down into its chemical components, which goes ahead to interact with medicines (which are also chemical compounds in themselves); like most chemicals would. "These interactions, therefore, can serve within the body to enhance behaviours that aid the action of the drug, delay its actions, complement its action or completely block its actions. "When the medication label says to take with a meal or after a meal, for instance, this simply implies that fat in the food can either delay or enhance absorption of such a drug," Mr Adongo said.